There are many different types of fungi growing throughout the world in a wide variety of environments and living conditions. 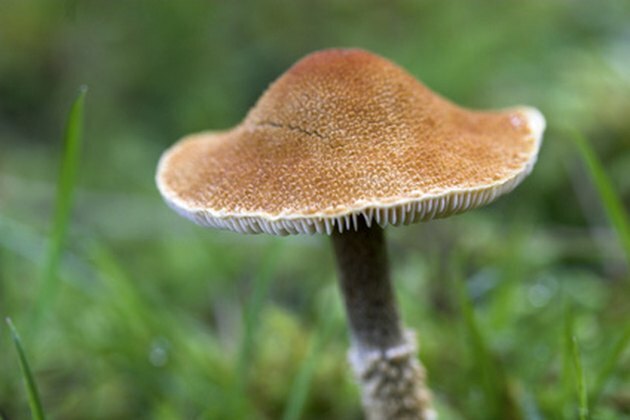 Fungi do not have the complex structures that plants do, which allow plants to use sunlight efficiently and produce large amounts of their own energy. Instead, fungi must rely on more flexible methods of absorbing the necessary gases and gaining their energy from the environment around them. Fungi exchange most of their gases underground. Fungi do most of their growing underground, away from the sunlight and open atmosphere where plants grow. However, fungi also breathe like other types of plants, despite their existence underground. They manage this through the natural pores in soil. Soil is made of many different substances, include particles of minerals, water, roots and organisms like fungi. In between these particles there are small pockets of air. This air, like the air in the upper atmosphere, contains everything plants need to absorb from the air, especially oxygen. If you were to remove an entire fungus specimen from the ground, you would notice a large number of thread-like roots that make up most of the fungus body. These hair structures are known as hyphae, and they can be so small that it is difficult to distinguish them from the soil around the fungus. These hyphae can grow into spaces that plant roots cannot and can absorb the oxygen from the microscopic pockets in the soil itself, exchanging gases with the soil instead of the atmosphere. When a fungus produces mushrooms or other growths, they exchange gas with the atmosphere just as plants do. Some types of fungus grow in very specific relationships with only life forms. The mycorrhizal fungus, for example, lives on a tree and grows myco-heterophyte parasites. The fungus absorbs nutrients from the tree and passes them onto the parasite growth, taking necessary nutrients along for itself. This type of particle exchange is rare and only applies to certain fungus relationships. Some types of fungus exchange gases based on their environment. Yeast, for instance, conducts respiration based on the presence of oxygen. If oxygen and air are available, the yeast absorbs oxygen through tiny pores in aerobic respiration. If there is no oxygen present, the yeast performs anaerobic respiration, absorbing what nutrients it can and causing fermentation in the process. What Does Decomposed Organic Matter Do to Soil?